With the amount of live recordings and interviews Gorillaz have done lately I thought it would be good to create a thread just like the one we have for The Magic Whip. Especially after those incredible Colbert live performances. Broadcast/publication dates are listed for interviews. 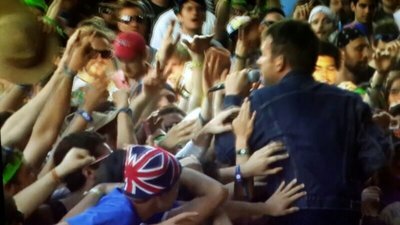 * Video taken from Damon Albarn Unofficial's YouTube channel. ** Recorded by Metro Fans. *** Taken from Austin Griffith's YouTube channel. At the moment, all the Humanz interviews and live sessions are listed on my site's TV, Radio & Internet page. But as I soon begin to delete these listings, it would be a good idea to make them available here. I've got a paid subscription with Mediafire (= non-expiring links and lots of space), so I could happily upload at least some of the material. All files are taken from the original sources to preserve the best possible quality. Great stuff!!! Thanks so much, Veikko! Many thanks! I've added your links to the downloads list. Anyone converted Demon Dayz to audio yet?